Whether considering a CyberStore Oasis subscription, or hosting of your CyberStore for SYSPRO license, here are some FAQs your will want to understand when considering your options. Click on any FAQ below to display the answer. Q:If I host my CyberStore 2 site, do I now need to batch process my orders and price changes? No, your hosted CyberStore 2 site is fully integrated to your SYSPRO in real-time. Q:Does my SYSPRO server need to be connected to the Internet? Yes, your SYSPRO server must be connected to the Internet in order to send and receive requests to and from the CyberStore 2 site. Q:How does CyberStore 2 communicate with my SYPRO over the Internet? CyberStore 2 communicates across the Internet with your ERP server using SYSPRO Web Services. Q:How do I know the connection to SYSPRO secure? CyberStore 2 ensures that all data between it and your SYSPRO server is encrypted using an SSL certificate. This ensures that those communications are completely secured. The encryption required is the exact industry leading standards that are used to secure financial transactions such as online banking and the most robust e-commerce sites. Q:Will my site be slower if it is hosted? Since the CyberStore 2 server is not located in the same physical network as your SYSPRO server a latency factor will be introduced. The speed and reliability of your company’s ISP will have impact on performance. To minimize the impact of Internet data transfers, CyberStore 2 utilizes application data caching techniques to minimize the number of calls made between systems. Q:Who provides the hosting services, and where will my CyberStore 2 site be located? CyberStore 2 hosting is provided exclusively by Dovetail Internet Technologies, the developers of CyberStore 2 for SYSPRO. The actual sites hosted are done so within a high-reliability hosting facility located in Massachusetts. Q:What happens if my Internet connection goes down? Should SYSPRO become unavailable to CyberStore 2 for any reason, the site will automatically switch to “Call Pricing” mode. This allows users to view product information, but during this time, they are unable to see pricing, add items to the cart, place orders overview order history until the connection again becomes available. Q:How is the setup different from an on-premise installation? 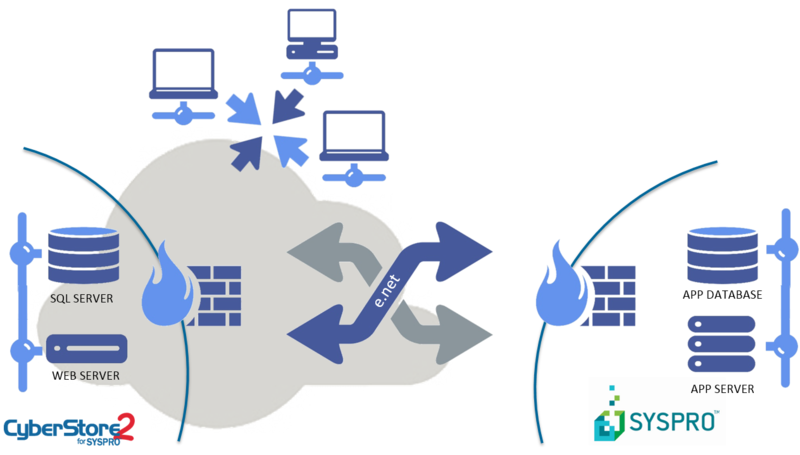 Technically, the only difference between an on-premise installation and hosted installation is the requirement that web services be installed on your SYSPRO server and that access be provided to it through your firewall for the CyberStore 2 server. Below is a diagram which shows the CyberStore 2 hosted platform along with your internal SYSPRO infrastructure?